Red Sonja #78 starts, just how I like my comics to start. In the thick of things and with enough action to fill TWO blockbuster summer action movies!! Brandon Jerwa continues this five part story line with a middle chapter that is chock full of story and action, and some pretty epic twists and turns. As this issue begins, we’re in the thick of battle between Sonja and her crew are battling the forces of the oncoming Lord Dracula. That’s right, kids. DRACULA. Yes, that one. Now, these two have battled before but never like this. This is a full out all hands on deck throw down between Sonja and Dracula. And it’s EPIC. This is one of the best issues of Red Sonja that I’ve read in a long time, and that’s saying something because I’ve certainly read my fair share of them. Some great story telling by Jerwa, here. 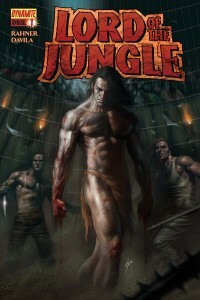 Lord of the Jungle Annual #1 is a good read for anyone that’s a fan of Edgar Rice Burroughs or Tarzan in general. It’s a classic story that some of you might be familiar with, but entertaining nonetheless. Writer Mark Rahner brings us Tarzan’s first trip to civilization! And believe me, it’s a really fun read. There’s been many versions of this story told in countless media, but it’s your classic fish out of water story, with a couple of great twists thrown in for good measure.